To be perfectly frank the entire reason for this blog entry is that once the headline popped into my head I could not pass it up. So I've had the headline sitting in my draft blog topics folder for three years waiting for a subject to write about. In the past months I have written a bit about fancy furniture and when we were developing our new veneer saw we had to cut a lot of veneer. So this gave us a chance to try out some new (old) ideas. Veneers are pretty thin so you have the opportunity to use all sort of exotic woods. However being lazy and economical it made almost no sense for us to buy exotic veneers just to test a veneer saw. By the same token if we didn't have a lot of different woods to play with the result would be pretty monochromatic. So we decided to re-implement an old new idea. You see a lot of that old furniture with plain veneer in museums used to be brightly dyed - only the color has faded over the centuries. Just as a test we took some fairly plain oak veneer and dyed it yellow and purple. The real technical challenge was using an alcohol based dye so that the dye would not run under the hide glue - as it would if we used a water based dye. But we still have to use a top coat. We could use either a water based poly or lacquer with no danger of the color leaching into the finish but Tim wants to French polish the top and he thinks a thin coat or two should dry before leaching out color so we should be OK. We will see. It's a pretty simple pattern - really a test of the veneer saw and a chance to practice hammer veneering with hide glue. 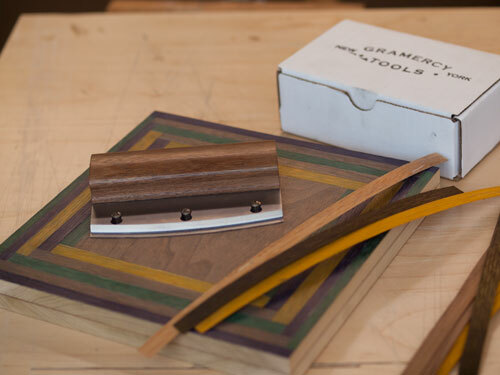 What we are really excited about is the new veneer saw. When I last wrote about the saw we were making handles by hand but now for the past few weeks we have been in full production and the handle bottleneck is long over. We have gotten a lot of great private comments on the saw and I hope with the new year we will start seeing reviews. There are a lot of cool new features in the saw such as interchangeable blades with different saw tooth patterns, a heavy steel plate that makes for a very rigid assembly and gives a nice weight to the saw, and of course the blades are all hand sharpened, beveled, and shipped ready to use. You can read more about the saw here. I haven't done much veneering yet, but hope to. In the mean time, your saw looks great for it's purpose. I have kind of an off the wall question. I've heard of using veneer saws similar to this to cut raised fields for beveled panels (the bevels are cut with planes, of course) in frame and panel doors and the like. Do you think your design would be suitable for the task as far as having a sufficient registration area to ride the edge of straight guide board and would it effectively limit depth of cut (i.e., would the holder stop further cutting when the blade's projection had been used up)? It looks like it would work, but hard to know without having it in your hand, or better yet, trying it out. Hats off to you for the play on words! Debbie Harry and Chris Stein would be proud.